Paul Vincent has come up with an original idea (at least to me). Set in the near future, the story involves two space agencies, one a European Union operation involving multiple countries and another for the USA. Of course, the US has developed a "black-project" spaceship, the Oppenheimer, but it's lost in space. The US agency goes to the European (primarily British) group to enlist their help in finding it. The British project chief is grateful to get the money required to complete their own ship for the rescue mission. Kefler believes this will be a straightforward rescue mission, although the US agency insists that six of the nine-man crew be American. The excuse is that the six are trained to be able to repair and fly the Oppenheimer. In the meantime, a mining ship in the asteroid belt is going about their business when they spot the lost ship. It's clearly dead in space. The Captain orders his own ship (the Icarus) to get to the ship as is the duty of captains throughout history. Now two ships are converging on the third black-project ship. Then, we get to the really fun part. The Icarus crew boards the Oppenheimer and it's immediately clear that something really horrible has happened. They find the first officer who surprises them by first saying he thought they were another hallucination. Captain Taylor has already noticed a strangeness about the ship from oddly warped passages to phantom crewmen who appear and disappear. 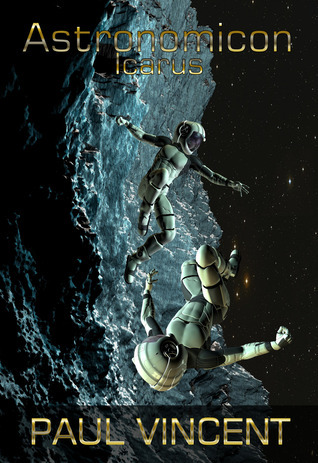 The reader can guess that things will not go well, especially for the crew of the Icarus. To say anything else would be a spoiler. One minor complaint I had is mostly due to my faulty memory. The Captains of the Oppenheimer's and Wagner's names were too generic: Lee and Smith. I always had to stop to figure out which was which. On the other hand, the crew of the Icarus had very unique and unusual names, which made it easier to remember which was which. I also note that British spelling is used, but I'm at a loss at the rank Coronel (as in Colonel). Perhaps because the Coronel is Spanish? Even so, it's a usage that bothered me enough to be irritated, especially since the Coronel is a minor character. There's no purpose in confusing the reader unless there's a big plot point surrounding its use. This is a good read and straight SF (despite the weirdness on the Oppenheimer). I enjoyed it and easily recommend it to anyone who enjoys SF. Sign into Goodreads to see if any of your friends have read Icarus.